Sandra Jenkins speaking to Gaston County high school students at the Gaston College Career Expo on March 23, 2017. Sandra and Jill Harrill at the Gaston County Career Expo. A glimpse of the STI booth at Gaston County Career Expo. Students are able to see samples of our fabric and yarns, as well as view our videos. Sandra leading orientation for 7 new STI employees! Sandra Jenkins has been an employee of STI for almost 24 years and started here at the ripe age of 18. Over the course of 6 years, Sandra worked numerous positions in the plant, but then switched lanes in 1999 and joined the office staff in the Purchasing Department. In 2015, she transitioned to the newly created position of Human Resources Generalist. Sandra’s main responsibility at this time as a HR Generalist is to recruit new talent. 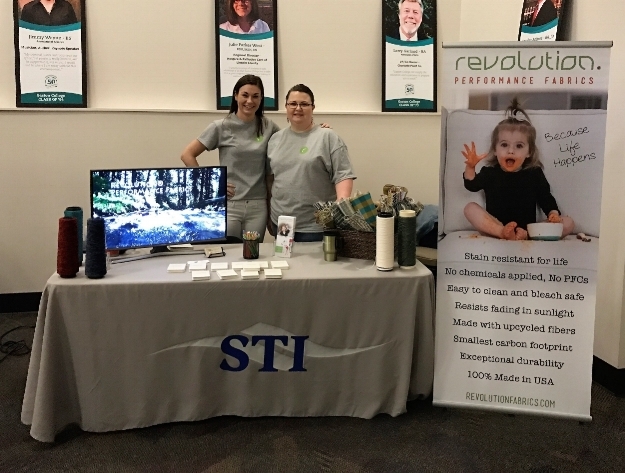 Having started with the company straight out of high school, she is more than qualified to speak about how STI can provide a career and livelihood to high school students that may not be interested or able to attend college. Having been with the company for over 20 years and working a number of positions, Sandra (and a few others) coins herself as a “jack of all trades, but a master of none!" What does a HR Generalist do? Can you tell us about the growth in staff you have seen since joining the HR team? What was it like for you starting with STI after high school? “I was too young to take advantage of the 401k benefit because I wasn’t 21, so that was really funny! I didn’t envision STI to be my lifelong career. I worked at a department store and at my Dad’s textile plant when I was in high school. When I graduated, I needed money and insurance so I came to STI as a cloth inspector. I am the type of person to move onward to the next project or position, which has helped me get to where I am today. What was it like transitioning from the plant to the office? Can you tell me about your recruiting process? When you are talking to students who are 18, what are some of the things you are looking for? What do you look for on a resume or application? What do they ask you?